American football is not the most simple sport, and those not familiar with it might not find NFL games of great appeal. 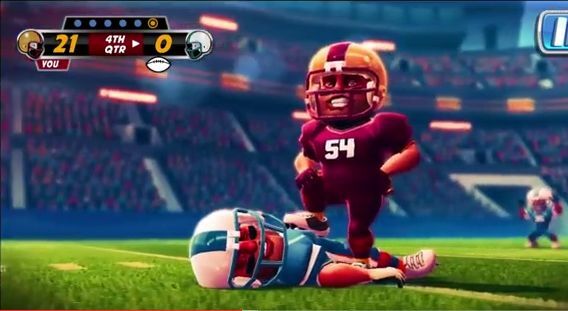 Boom Boom Football is an American football game for the iOS and Android that does not strive for realism. Instead, it combines a card game with in-game action on the field to deliver a simple, yet fun, U.S. football title. 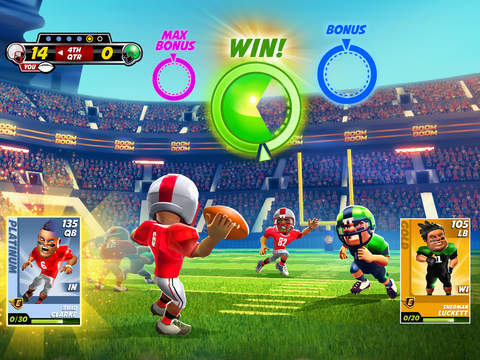 In Boom Boom Football you manage teams of seven players instead of 11. Each player card includes one rating that highlights how good he is in his position. Merging player cards together boosts their ratings. One player merges with another, who is subsequently removed from your squad. Alternatively, with two matching cards you can select to evolve players to give one of them a greater rating boost. You can buy more players with the game’s gold currency and bonus packs that are freely available. Before a game kicks off, your team’s player ratings are compared with the opponent. That tells you if you are playing a poorer or stronger side than your own. The teams with the highest ratings are more likely to win, but not necessarily guaranteed victory. The games have six match ups over four quarters. They include the throw, zone defense, pass defense, catch, tackle and run. In each match up (aside from the kick) players tap an orange, blue or purple circle target to defend or score. Tapping the smaller, purple circle gives you a greater bonus and the best chance of effectively defending or scoring. Drawn matches usually go to a kick in which you tap a moving arrow on a bar to kick and score. There is no doubting the graphical quality of Boom Boom Football. The game has smooth 3D graphics with rotating camera angles for its reel gameplay moments. It also has some great lighting effects with players that glow in the floodlight stadiums. Boom Boom Football’s audio is also pretty good. The sound effectively captures the atmosphere of football games. There is plenty of cheering and chanting from the crowd, and the matches include crisp and clear in-game speech from match officials. 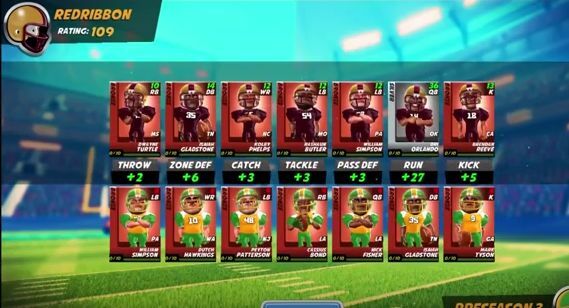 The gameplay is a little short of variety, but Boom Boom Football is still fun. All the football matches seem pretty much the same. Only the kick adds any notable variation to in-game gameplay. The playing conditions are also identical in each match with no alternating weather. Furthermore, the bowl tournaments in the single-player game all have identical formats. Hothead Games should have added multiple leagues, with promotion and relegation, to give the single-player mode greater variety. Its multiplayer modes have leagues in them, but as you play random opponents not in the table they are not truly leagues. 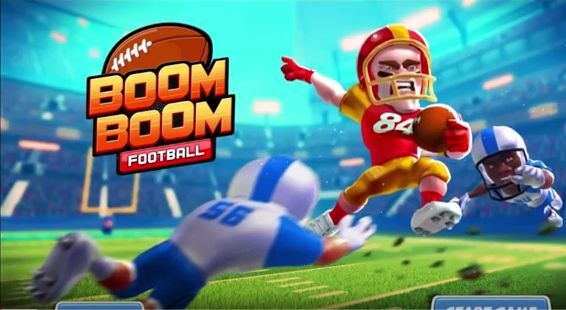 Boom Boom Football is an original and fun U.S. football game with great graphics. Even though it lacks variety, as a free app this is certainly a game to note. Check out this page for further details.